We messed up this past week! For those who visited on Monday and Wednesday especially and felt that you didn’t receive sufficient value from RideMax, please contact us at “support at ridemax dot com” and let us know! 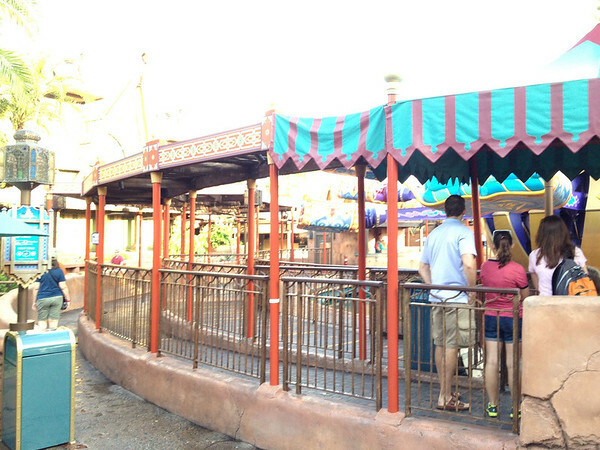 Magic Kingdom Touring – Dumbo NOT First?!! 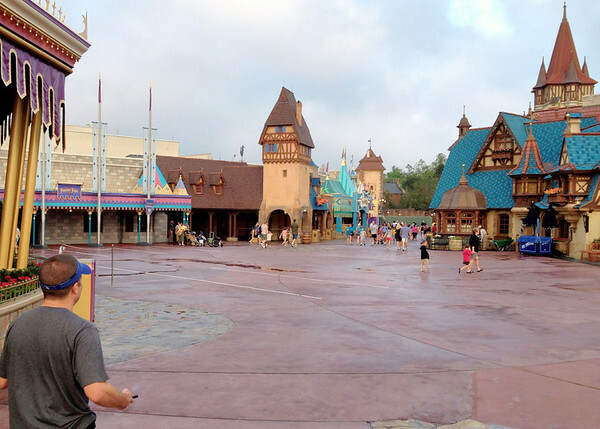 I know that even contemplating such a thought is considered heresy in the “expert” world of touring the Magic Kingdom, but is there ever a time when you might want to NOT visit Dumbo first thing in the morning? I ask because in experimenting with a few RideMax plans for this very busy week before the Easter holiday, I noticed that some of the Magic Kingdom RideMax plans were coming up with Dumbo LATER than first thing in the morning. 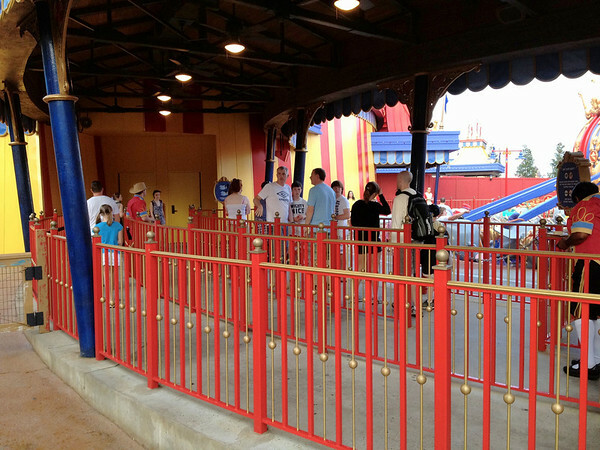 Assuming that some of you may be seeing the same thing and thinking RideMax must have gone nuts to *not* recommend Dumbo first during such a crazy-busy week, I thought I’d take you on a photo tour from Monday morning’s EMH at the Magic Kingdom. 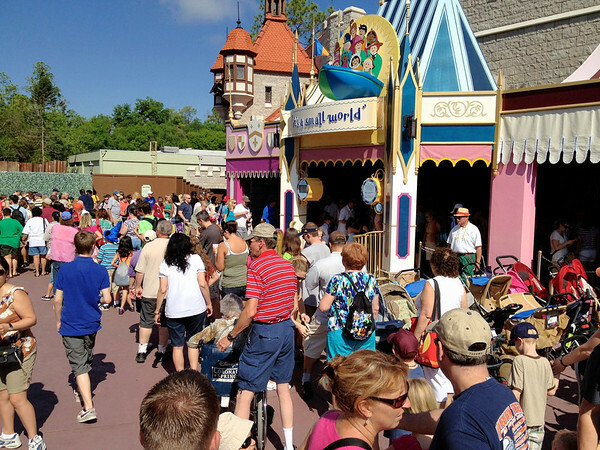 Keep in mind that later today, Disney itself would report the line for Dumbo at 130 minutes! 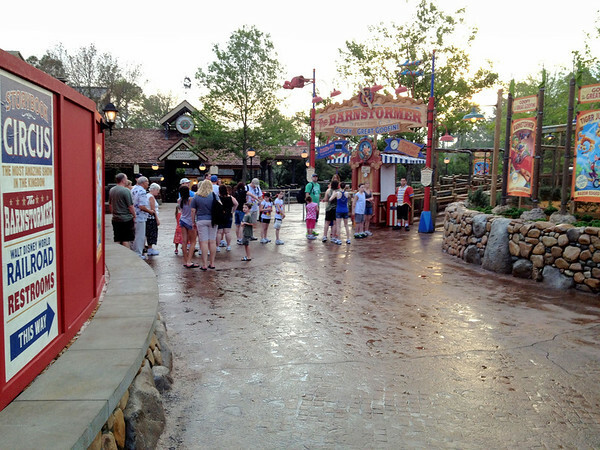 The above is a picture of the line for Dumbo at 7:36am. 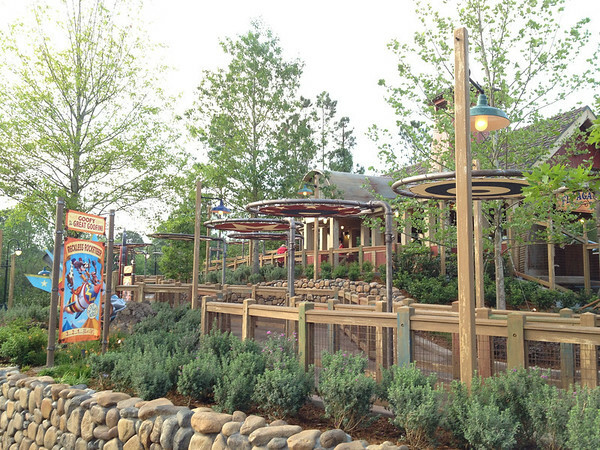 More than half of the EMH hour is gone, but Dumbo is easily still just a one-cycle wait. 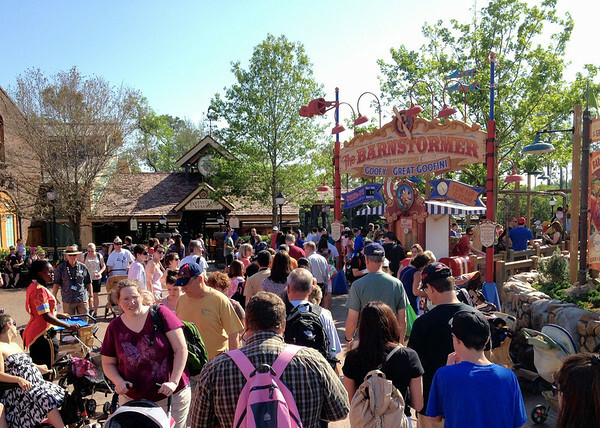 The above shows the line for Barnstormer at the same time in the morning. The ride is down right now, but there are just a handful of folks milling around. 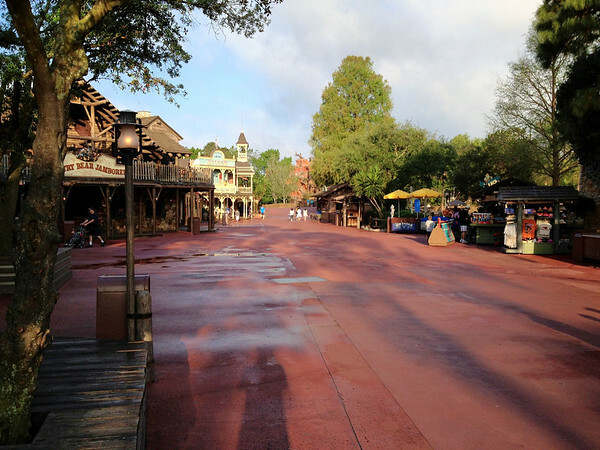 Fantasyland at 7:46am. Nice wide-open spaces! 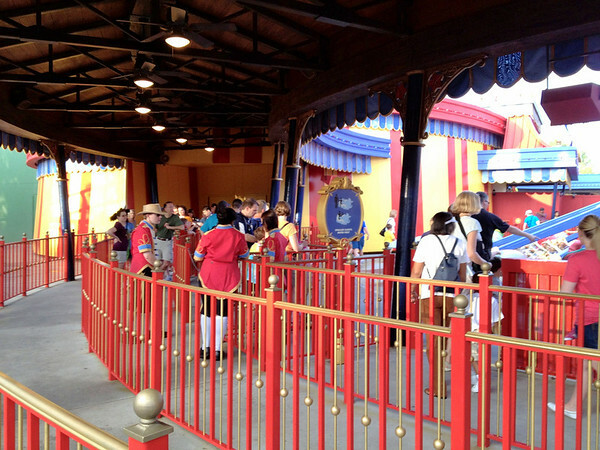 The above picture shows the line for Dumbo at 7:50am. STILL just a one-cycle wait! 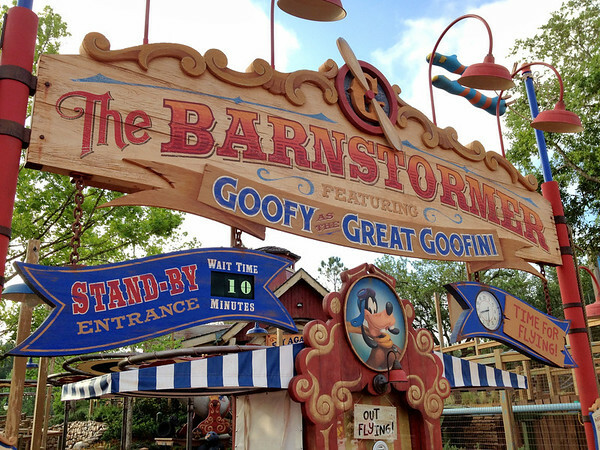 The Barnstormer queue at 7:52am. The ride is open now, but still no line here. 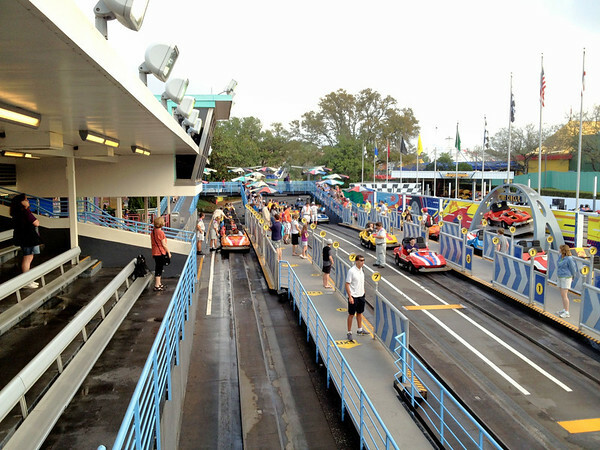 Random picture of the Tomorrowland Speedway just before the park opened for regular guests at 8:00am. Dumbo at 8:04am. Finally a line here! I’m estimating it’s still just between 10-15 minutes though. 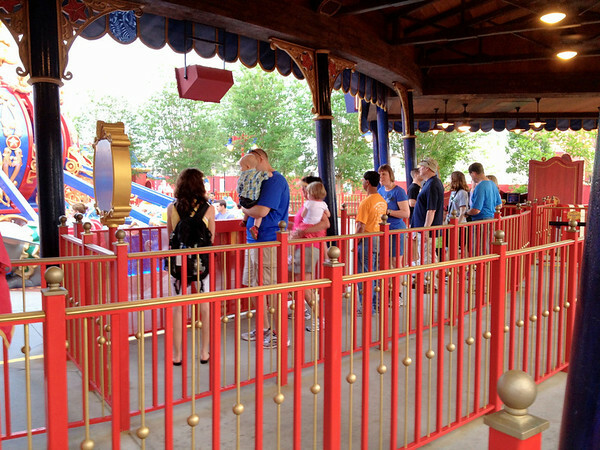 A quick hop over to Adventureland shows no line for Aladdin at 8:15am. 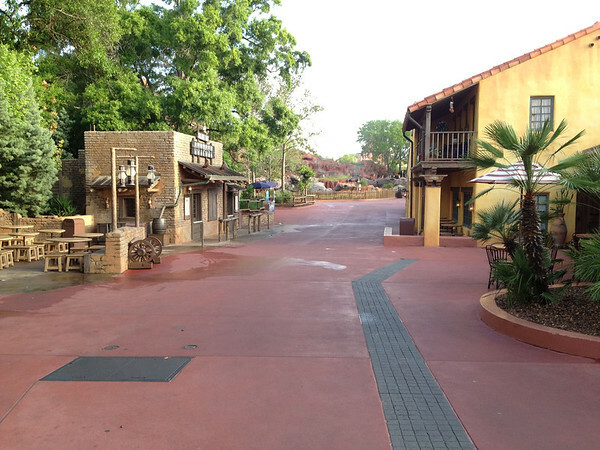 Pirates is looking pretty deserted too. 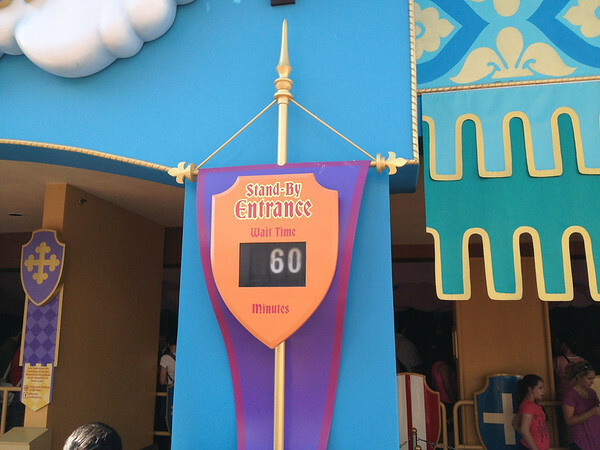 Disney would report the wait here at 50 minutes later this afternoon! Another deserted walkway at 8:15am! 8:20am. What’s not to like? Still no line to speak of! Now, let’s take a break and come back for more pictures later in the morning, shall we? Here is the area around Space Mountain at 10:16am. 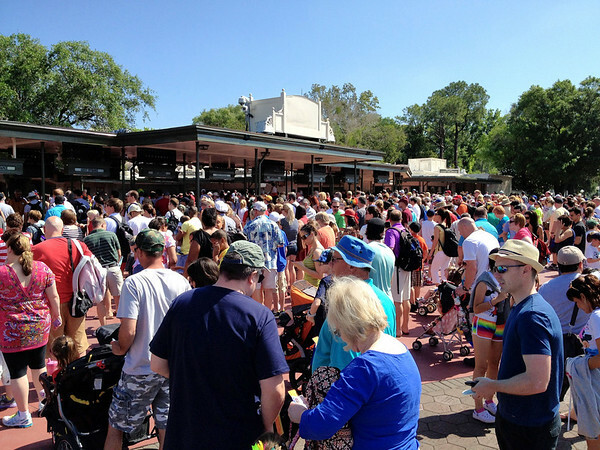 The line on the left is for the FastPass machines! 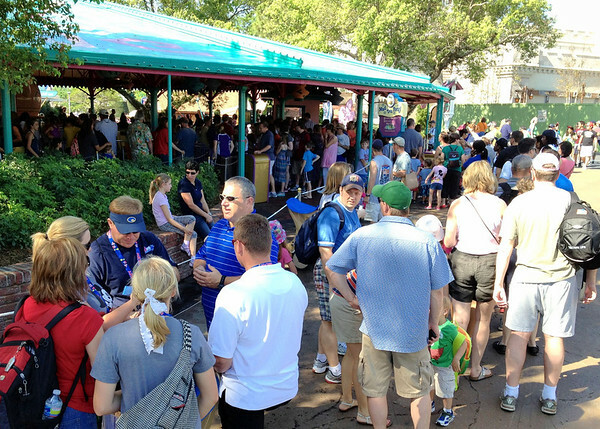 The line for the Teacups at 10:29am. Yikes! Random shot over the construction wall. 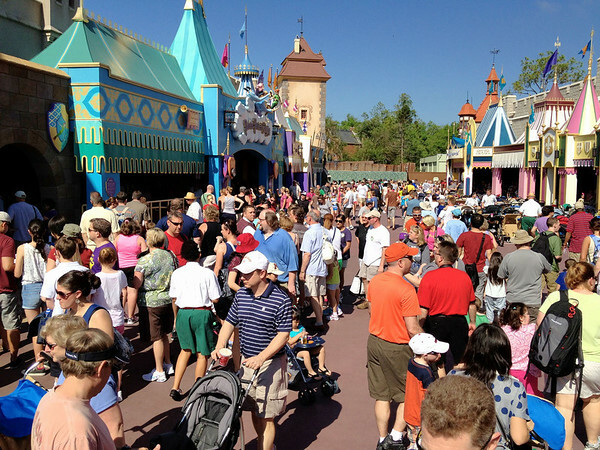 Fantasyland at 10:37am. Why would anyone do this to themselves??! “it’s a small world” at 10:41am. Wow. Peter Pan’s not looking too great either. So, back to my comment previously about Dumbo. 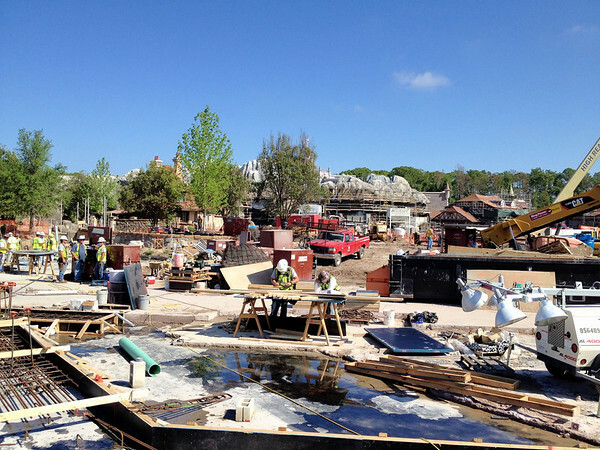 As you can see, the crowds didn’t really start building until around an hour after the EMH began, when the park opened for regular guests. 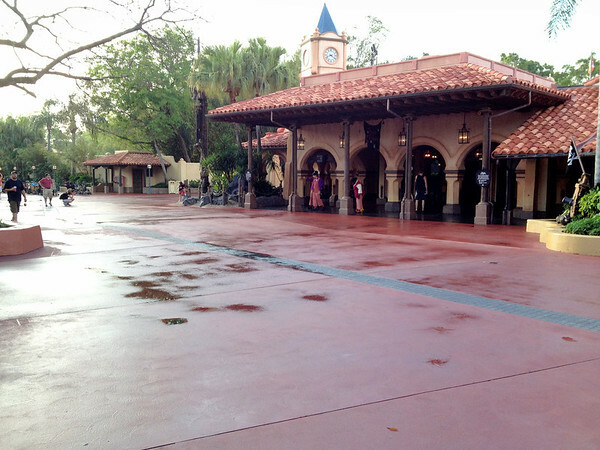 I have to stress, however, that I wouldn’t expect to see this pattern on a day when the park opens later. 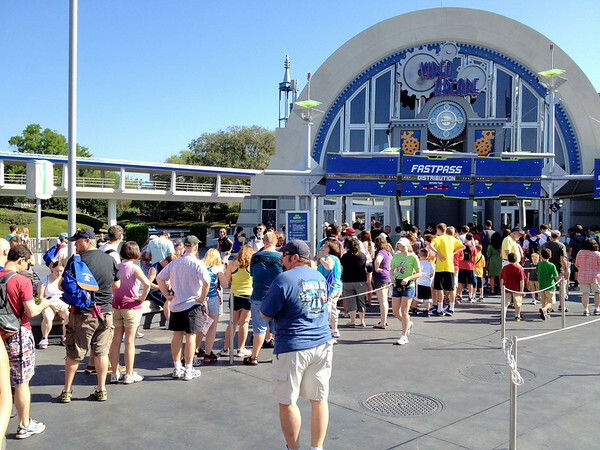 This week is unique, because the EMH begins at 7:00am, and further, morning EMH is being held every day of the week, further diluting the crowds taking advantage of the EMH on any given day. There also seems to be something about a 7:00am start that simply makes it hard for people to get there in time for the really low crowds. 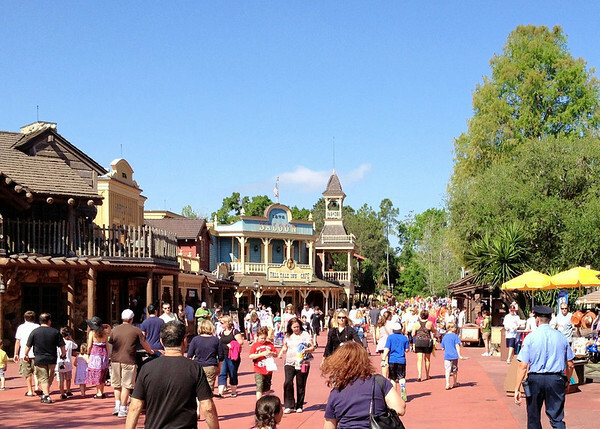 So, if you’re visiting the Magic Kingdom this week and next, be sure to arrive early and enjoy the lack of crowds while you can. And if you are visiting during the EMH at this time of year, don’t be surprised if RideMax has you NOT visiting Dumbo first. With crowds this low first thing in the morning, it might save you some walking time to hit another area of the park first, and circle around to Dumbo a half-hour later or so. I wouldn’t necessarily suggest this at another season of the year, but 7:00am openings are amazing and unique, and worth taking advantage of if you can! Have a great time at the parks! 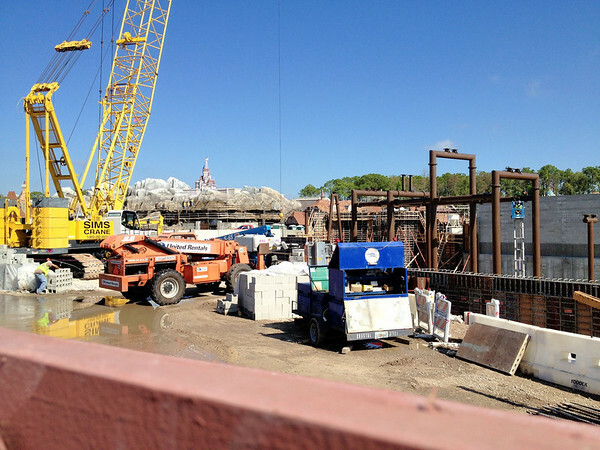 Author Mark WintersPosted on April 4, 2012 Categories Uncategorized1 Comment on Magic Kingdom Touring – Dumbo NOT First?!! 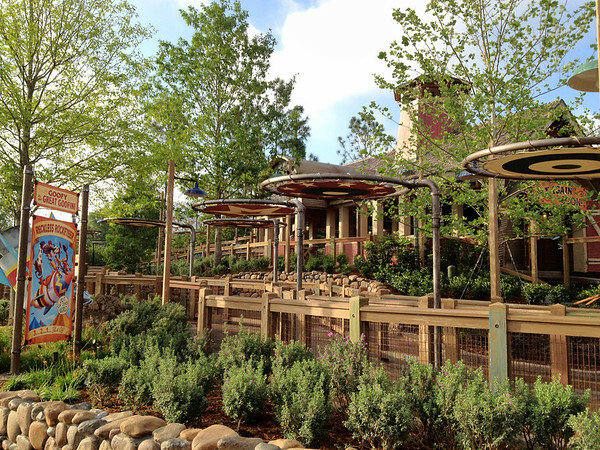 OK, you’ve all probably heard by now the FastPass rumor that Disney plans to start “enforcing” the FastPass windows at Walt Disney World beginning March 7th, 2012. Is the rumor true? I’m not sure just yet. But you can be sure I’ll be in Walt Disney World on March 7th to check this out, and I’ll report back here on my findings! Since some of you have asked how this might affect RideMax, I’ve included this short video to help explain what this change means, and how you can use RideMax to help plan for it. 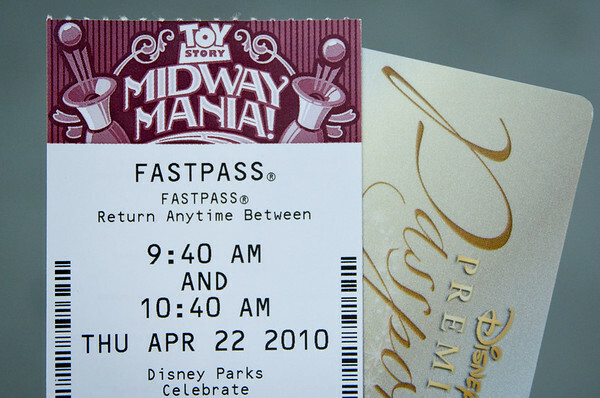 Author Mark WintersPosted on February 8, 2012 March 31, 2012 Categories FASTPASS, RideMax, Walt Disney World12 Comments on Disney FastPass Changes! Stop and Say “Hi” in the Magic Kingdom Tomorrow! 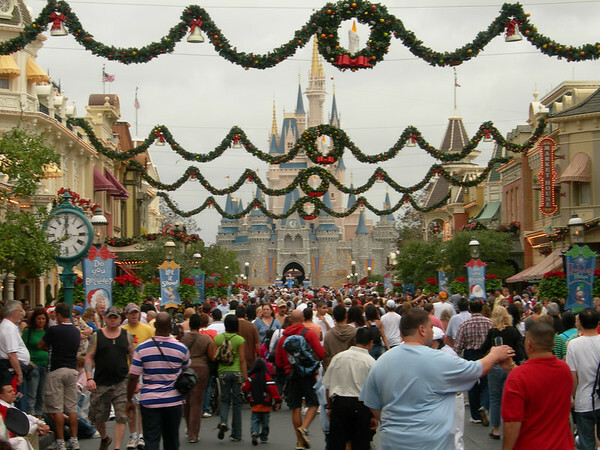 I plan to be in Disney World’s Magic Kingdom tomorrow morning, December 27th. If you see a really tall guy wearing a RideMax shirt collecting wait time information, be sure to say hello! Although I’ll be something of a moving target, if you’re using the mobile version of RideMax in the park tomorrow, you should be able to track my movement fairly well by noting the wait times I post in RideMax. I hope to see some of you tomorrow! As the author of RideMax, it’s sometimes amazing to me how little paid advertising we’ve had to do for RideMax. Happy customers who have actually used RideMax at Disneyland or Disney World, and who then recommend RideMax to their friends, has really done most of this work for us. So with that, here is yet another of those nice RideMax reviews. Thanks also to Rich Pearson, for his kind words here about RideMax. Reviews of RideMax like these from actual customers are so appreciated! Now a question: How did you first hear about RideMax? A friend? An online article? Please let me know in the comments below! 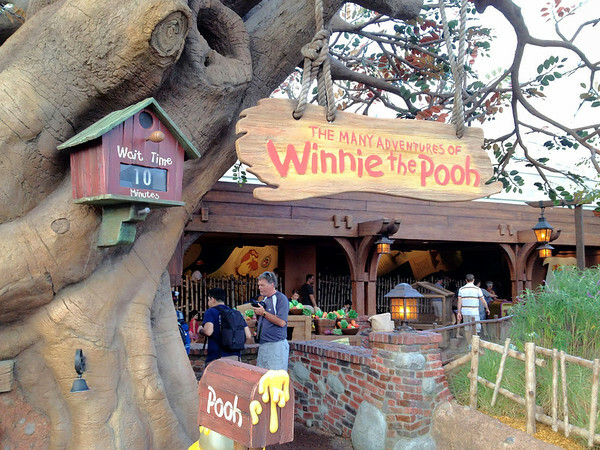 Author Mark WintersPosted on November 26, 2011 March 31, 2012 Categories Disneyland, RideMax, Walt Disney World2 Comments on RideMax Reviews – Thanks!